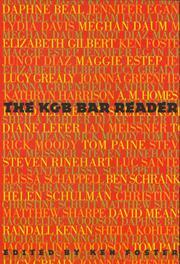 Short stories and essays, original publications, reprints; and selections from the KGB reading series itself all belly up to the literary bar in this anthology. The KGB Bar, on Manhattan’s East 4th Street, decorated in post-Soviet kitsch to honor the bar’s past life as home for the Ukrainian Communist Party’s US headquarters, has established itself as one of New York’s literary epicenters, including a highly successful public reading series. Editor Foster, after answering a flyer tacked up on a bulletin board at Columbia University, where he received his MFA, organized the series in 1994. In his selections there’s no sign of old fashions in writing, either New Journalism or K-Mart fiction, or in fact any overarching common aesthetic. The essays, though few in number, stand out in sharp relief from the fiction: Lucy Grealy reflects on the intimacy of her tango lessons in “Dancing a Sad Thought”; Elizabeth Gilbert reports on women who chase rodeo cowboys in “Buckle Bunnies”; Meghan Daum mourns for a friend who hardly bothered to live; and Joanna Greenfield remembers being attacked by a hyena while working with wildlife in Kenya (which makes just about anything of Hemingway’s look wimpy). The fiction assembled tends toward the lyrically shocking and features capable offerings from series favorite A. M. Homes, as well as Jennifer Egan, Rick Moody, Kathryn Harrison, Lydia Davis, Luc Sante, and other established writers. One stand-out is Junot Dçaz, whose “Ysrael” is matter-of-factly disturbing in its reckoning with childhood persecution. Of his own selections, Foster complains, “Many people were eliminated [from the book] by their publishers’ inability to allow their work to be republished” (e.g., Elizabeth Wurtzel, who read from Prozac Nation at the inaugural reading). A round from one of New York’s newest literary lions’ dens.